Access live and recorded video from any camera using an Apple computer. 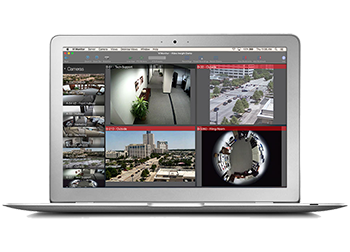 View your entire system geographically with embedded live camera icons. Expand these icons into full screen views with one easy click, or quickly transition from one map to the next with an embedded Layered Map Icon. Maintain a sense of depth and continuity when transitioning from one element to the next. VI Monitor for Mac’s naturally stacking interface always allows users to easily track their path through the application, preventing clutter & confusion. Create custom layouts by simply dragging and dropping any camera from your list on to any available display. Each camera view is fully self-contained, providing unprecedented granular control over its functionality. Even when monitoring a custom layout, VI Monitor for Mac’s unique live camera tile list empower users to be aware of their entire site, with just a quick glance of one’s camera tree. With one click convert any live camera view to review its recorded video. Use the quick slider bar to rewind or fast forward through the day’s events, or find an event of interest through time stamped thumbnails located in the motion event logs.